Over the years the crossover category, call it what you will, has morphed into a substantial board and sail discipline in its own right, resulting in every brand offering a broad range of ‘crossover’ boards from around 80L right up to over 110L. The desire to have ‘one board to do all’ is about as old as the sport itself. Back in the late eighties and early nineties for example, it was boards such as the Mistral Screamer that stole the limelight, offering an ease and practicality of use over a wide variance of sea states and rider styles. Back then these chameleon boards were classed as wave-slalom, combining two of only three disciplines that existed in the world of ‘funboard’ windsurfing. How times have changed … or have they? We take a closer look. This test was originally published in the April 2015 issue. Today, we certainly don’t have a problem with too few classifications; in fact it’s the opposite. The introduction of the ‘free’ concept has seen an explosion of categories and disciplines. However, the core elements and demands on the crossover discipline remain largely the same – a board should be fast and lively in a straight-line (slalom), manoeuvrable and capable of mixing it up in waves (wave). So is wave-slalom still the underlying principle of this category? Several of these boards are called Freestyle-Waves; JP Australia go one step further and claim the origin of the class, citing that brands followed them down the path. And at its conception, the classification seemed to fit. Freestyle was a new exciting discipline and, like wave, had its requirements solidly rooted in the ability to do manoeuvres. As freestyle has evolved however, so have these demands on equipment, so much so that a freestyle board is such a specialist machine that we couldn’t think of a worse platform to take into a wave break! So what of this freestyle-wave title? You could argue that it is somewhat obsolete today. Sure, a good freestyle sailor could no doubt dazzle the crowds using one of these boards, but they could probably do so using a barn-door also! If you want to push your freestyle ability, the quickest route will always be a specialist freestyle tool. Modern freestyle boards do however place an emphasis on early planing and acceleration and good ‘pop’ and controlled ‘swing’ for aerial manoeuvres. Those attributes do crossover into this category and rather than get hung up on a title for these boards, it’s better to concentrate on the positive aspects from Freestyle, Slalom and Wave that the hybrid DNA of the boards draw on to give a well rounded package, able to cope with the varying range of conditions that the average UK sailor has to face. Another observation from this year’s test is just how many of these boards come with a multi-fin option. Five out of seven … as opposed to half last year. This trend towards offering more fins shows the level of progress being made in multi-fins for wave sailing. This can no longer be a possible fad, the fin box type now being used is of reduced weight and the fins provided are no longer heavy and draggy, so the historical barriers to multi fin performance in this category have been removed. Multi-fins are undoubtedly here to stay and with them they’ve brought a new level of performance on a wave face and an increased range of use to those boards suitably equipped in this category. A versatile discipline not surprisingly gives rise to a diverse range of performances. The RRD FSW 94 is a unique feeling board that exudes control, allowing its rider to enter any arena confident that they can concentrate on their own performance rather than that of the board. Similarly, the Tabou is super controllable when the chips are down, ironing out the roughest seas with its pronounced double concaves. The JP on the other hand is a loose, lively and exciting contender, more akin to a fast punchy wave-board … although it’s been suggested by the brand that this looseness is tempered in the FWS version by making it a single-fin. The Fanatic follows in the same vain, but has an ease and marginal wind ability that also makes it incredibly practical in a wave environment. The Tetra and Kode Freewave champion early planing and speed respectively, and with these attributes come showmanship. Get on the plane earlier than most, charge around a break and hit ramps at speed. Can’t be anything better to bring a smile to your face. We were lucky enough to be able to try the Kode with both single fin and thruster set up, which demonstrated just how much this ability to change between the two varies the style and feel of the board. And then we come to the One by Goya, which displayed one of the most versatile and well-received performances in the group. We had lots of fun trying these boards … and there is definitely one here to suit and flatter every style of riding, the choice is yours! This test was conducted at the beaches of Overcombe and Bandstead within Weymouth bay and the Official Test Centre (OTC) at Portland, Dorset. The OTC centre is based within the grounds of the National Sailing Academy that hosted the Olympic sailing classes in 2012. 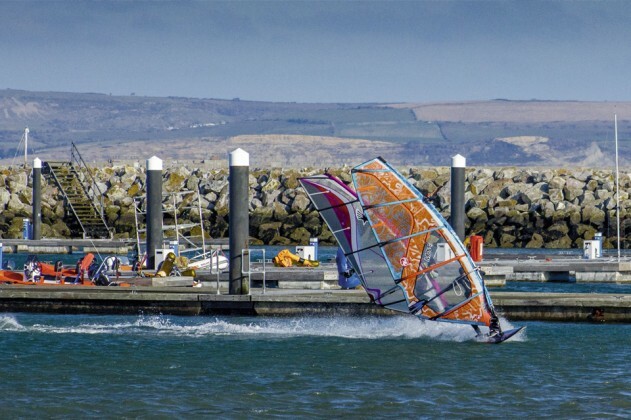 With the best wind stats on the south coast, mirror flat water in prevailing winds and a safe launch area with excellent facilities, it provides the ideal test venue. Much of the kit is still on site, so why not go and try some of it for yourself?